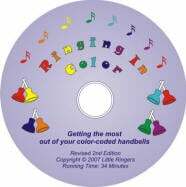 Ringing In Color (Getting the Most out of Your Color Coded Handbells) This video describes the variety of products, publications and accessories for color coded handbells. You'll see the products up close and in action with children ranging from kindergarten through 8th grade. Whether you've already purchased color coded handbells or are just thinking about it, this video will be help you to understand the products and techniques better. Shows both the chord method and melody method of playing in a variety of settings. Running time 32 minutes. DVD format.